Breck Parkman was born and raised in the South, but since 1971, California has been his home. An award-winning archaeologist with over 30 years of professional experience, Breck is also a writer, photographer, and avid world traveler. Currently, he lives with his son in the hills overlooking the famed Valley of the Moon in Sonoma County. A long time employee of California State Parks, Breck serves as a Senior State Archaeologist. He is assigned to the Bay Area and Sonoma-Mendocino Coast Districts. The several dozen State Parks that Breck works in are centered about San Francisco Bay and on California’s North Coast. Since this is considered by many to be one of the most beautiful areas in the world, Breck is very happy to work there. His office is located across the road from General Mariano Vallejo’s Petaluma Adobe, a National Landmark constructed in the mid-1830s during the Mexican Republic Era. 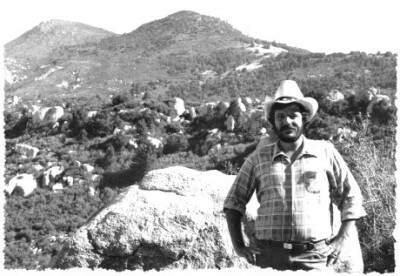 Breck joined California State Parks on January 2, 1981, beginning as a State Archaeologist with the Resource Protection Division in Sacramento. During that time, he directed large-scale cultural resource surveys for General Plans in State Parks throughout California. Breck is especially fond of the time he spent working at Cuyamaca Rancho State Park and Torrey Pines State Reserve in San Diego County, at Henry Coe State Park in central California, and at Olompali State Historic Park and Annadel State Park in the northern San Francisco Bay area. In 1983, Breck became the State’s first Regional Archaeologist when he took a position at the Northern Regional Headquarters in Santa Rosa. In that role, Breck helped manage the cultural resources of about seventy State Parks in northern California. 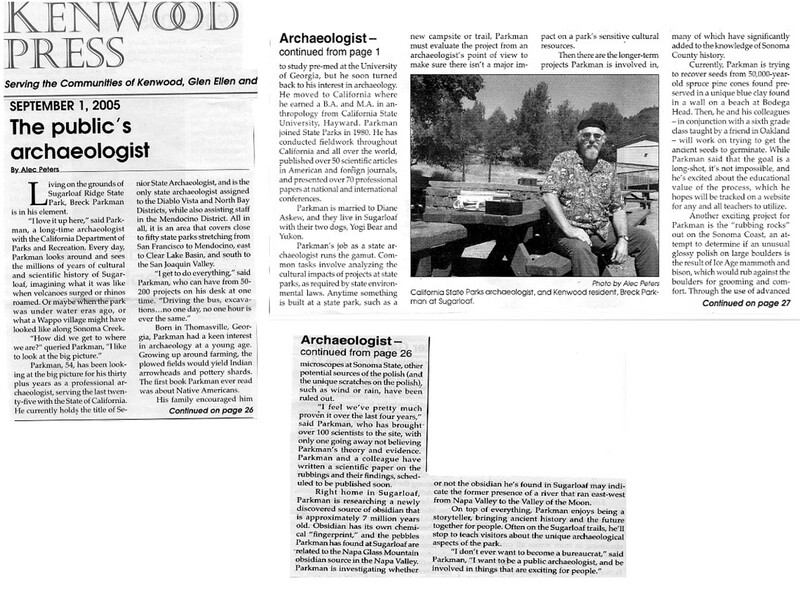 In 1993, Breck became the first District Archaeologist when he transferred to the Silverado District Office in Sonoma. The Silverado District gradually evolved into the current Bay Area District. Breck’s position has not changed that much over the years. It involves strategic planning and project review, environmental compliance, field surveys and excavations, collections management, contract management, Native American contacts, and public interpretation among other things. at Cuyamaca Rancho State Park, 1981. Breck began his professional training as a Pre-Med student at the University of Georgia in 1970, but soon realized that he was more interested in archaeology than medicine. He moved to California the following year, where he eventually earned his B.A. and M.A. degrees in Anthropology from California State University, Hayward. While at Hayward, Breck was a student of many gifted anthropologists to whom he is greatly indebted. His professors included Drs. Alan Almquist, Barbara Anderson, Lowell Bean, Peter Claus, Glenn Custred, Edward Jay, Lindy Mark, Robert McKnight, George Miller, and Clarence Smith. Breck has conducted fieldwork throughout California, in the Pacific Northwest, the Canadian Plains, the South Coast of Peru, and in Central Siberia. His research interests have taken him around the world, especially to the countries of the Pacific Rim. Breck is particularly interested in rock art studies, symbolism, and shamanism. Many of his publications concern these subjects. 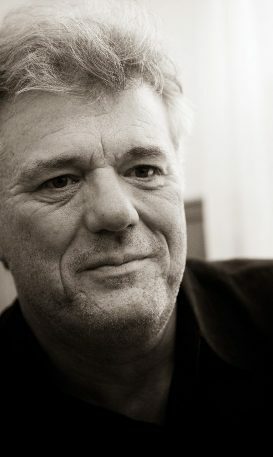 Other interests of his include such topics as Rancholabrean megafauna, paleoecology, Paleoindians, bedrock mortars, antlered dragons in New World mythology, Elizabethan California, the Russian American Company, antique silverware, the archaeology of the 1960s, the history and influence of the Beats, the life and craft of Bauhaus master potter Marguerite Wildenhain, and the sculptures of modernist Benny Bufano. Currently, Breck is involved in a multi-year research effort to identify what he believes to be mammoth rubbing rocks of the late Pleistocene. He is also working to record the archaeological history of a c. 1967-1969 hippie commune at Olompali State Historic Park and a c. 1961-1969 U.S. Marine Corps Reserve war games training site at Annadel State Park. 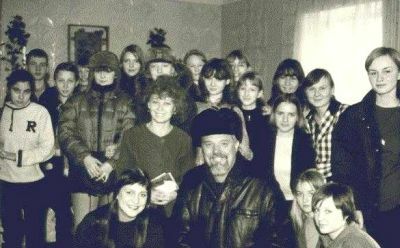 in a Siberian Classroom, 2000. Breck has published numerous scientific articles in American and foreign journals and presented scores of professional papers at conferences as far away as Flagstaff, Arizona, Calgary, Canada, Moscow, Russia, and Darwin, Australia. His work has been featured in hundreds of interviews with newspapers, television, and radio stations throughout California and the world. Breck appeared on PBS with the late Huell Howser in five episodes of California’s Gold and he has appeared in numerous documentaries, including the BBC’s 2013 mini-series, “Ice Age Giants.” As a civil servant working in the name of the people, Breck feels compelled to share his work with the public, something that he does regularly through various campfire programs, public talks, and the news articles generated by his contacts with the press. 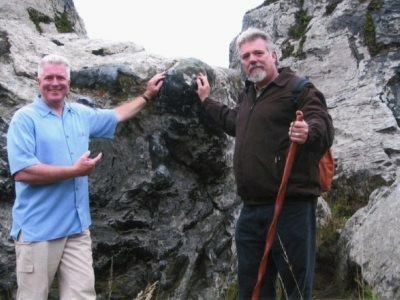 Breck is a past President of the Society for California Archaeology and a long time Research Associate at the Archaeological Research Facility, University of California at Berkeley. From 1996-2000, he served as the Director of the UNESCO-sponsored Fort Ross – Global Village Project, which brought American and Russian school children together on the Internet in the study of history and archaeology at Fort Ross State Historic Park. In 1998, as part of the Global Village undertaking, Breck led a delegation of California students to Siberia, where they lived with Russian families and participated in archaeological research near Lake Baikal. In 1999, he helped bring Russian children to California, where they participated in archaeological research at Fort Ross. Breck enjoys his work as an archaeologist and he believes that archaeology has an important role to play in the future. He feels that by studying, conserving, and interpreting our planet's cultural resources, we help to ensure a healthier and more understanding society that is both aware and proud of its cultural heritage and diversity. Indeed, archaeology informs us where we have been and it provides us with the information necessary for planning our future course. For Breck, the Human Story weaves together the histories of the famous and the forgotten, those important few who remain illuminated on center stage long after their passing, and the many others whom history has pushed toward the edges of visibility. Upon this scene comes archaeology, the detective science that sleuths its way through the back alleyways and dark corners of the past, searching out clues to the events that transpired there, and from those clues, retelling the forgotten acts of humanity. California is one of the most interesting stages on which this drama has been played out. That is why Breck enjoys being a California State Archaeologist. filming an episode of California’s Gold.